Giftwrap provides the best quality desk sets to please those with elegant tastes. Giftwrap offers you an eye catching desk item in real glass. The perfect desk set and a great gift idea for any occasion. 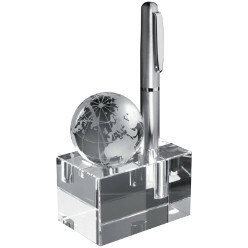 Desk pen stand also features a removable globe and a pen holder on a glass block. It provides a metal silver pen with a crystal clear globe. It is supplied in a blue gift box. It is a perfect gift for an executive, boss or a globe collector. It adds a touch of class to your desk leaving a good impression of you to others. It is available in two colors silver and clear. It allows it to coordinate with your desk beautifully. This desktop globe and pen stand is an ideal gift for a special co-worker or recently promoted loved one. This desk set will make it easy for you to access pen as you won't have to search for your pen under all the papers. It is an instant conversation starter. Giftwrap offers the best quality products. Try this desk pen and globe se by Giftwrap now, let your loved ones know their significance.